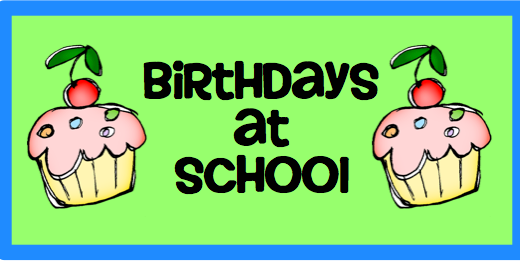 How do you celebrate birthdays with your students? Some schools do not allow special snacks (a.k.a. cupcakes), in those cases it takes more creativity on the teachers part to make a students feel special on their special day. I like to give my students a small gift to open. These are from Oriental Trading. They cost $3.75/dozen. I put in small things like glittery pencils, pencil grips, and silly bands. These are from Oriental Trading. They cost $1.99/50. The added bonus of these gift bags is they will add color to your classroom. I like to cut the tops of the sack off with decorative scissors, fold over the top, and staple it. Then hang them from a clothes line in the classroom. I had mine hanging in front of a row of windows. I hung the sacks on the clothes line in a pattern, secured it with a clothes pin, and TADAH! You now have a colorful addition to your classroom. Our class makes the Birthday Star a book, too. I am joining Denise @ Sunny Days‘s birthday linky party. Thank you Denise for hosting this party. What do you do for students with summer birthdays? I let the students choose between celebrating their birthday at the 1/2 way (6 months from their birthday) or the last month of school. I schedule the birthday celebrations so we only have one a day. I have the parents come in to read as a birthday reader (sometimes it is a secret). The parent can either just read a book or donate a book to the class. If it is donated, they glue a picture of the student inside and have the birthday child sign their name in the book. Parents can also bring in small items to pass out to the students if they want (ie. stickers, pencils, etc.). I have a Happy Birthday Day for ALL of the kids so we can have one big celebration. We do several activities: we draw names and make another person in the class a birthday card, without speaking the boys put themselves in birthday order from January to February, we have birthday treats and a party favor, and I also give them a small gift. We do birthday fractions and more……It's a fun day!